The Ninja Librarian came out of nowhere. I don’t mean Ninja Librarian the man, I mean Ninja Librarian the book. As we set up the Middle Grade Elves book tour I was assigned Rebecca’s series. It certainly sounded interesting. As I read it I had a feeling I was enjoying something special. The pages turned and turned as I met some fascinating characters and twists and turns that delighted me. While this is a Middle Grade book tour, I highly recommend this series to anyone, of any age. 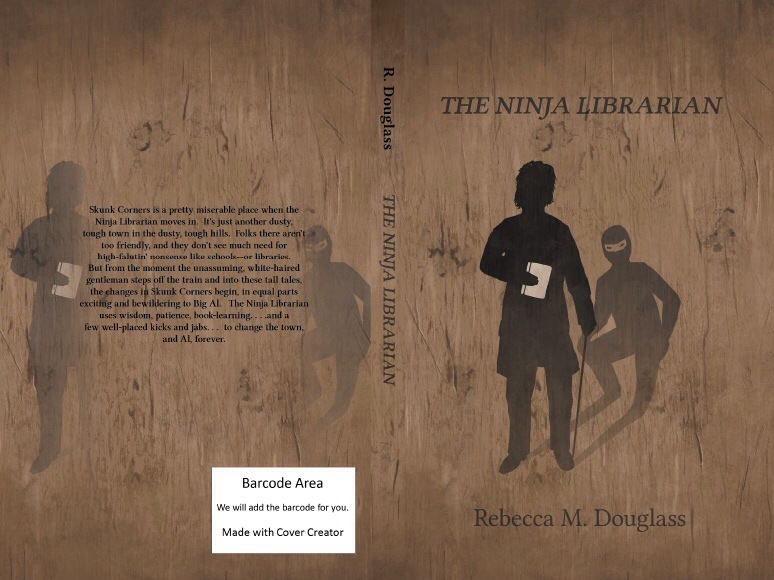 I had a chance to interview Rebecca about The Ninja Librarian. It’s a good primer for her book series, but should also be fun for those of you who have read the book. Can you tell us how you came up with the idea of a ninja librarian? The Ninja Librarian has a real-life model. Admittedly, Tom the Librarian from my work may lack some NInja skills. But he shares his looks with the Ninja Librarian–and was responsible for the line that started the idea bubbling in my fertile imagination: “I don’t get mugged; I’m trained to kill.” He really did say that one night at work, and the whole idea pretty much exploded into my head at once. Fortunately it was a slow night at work, because I had to grab pen and paper and start writing. Originally, I wrote the stories just for my co-workers, but I eventually realized I had a book others would enjoy, and began putting it together in earnest. The stories fell into a pattern of problem-solving and thinking outside the box that I liked, so I went with that. Al reminds me of Deadwood’s Calamity Jane. What appealed to you about a “Wild West” setting for the stories? I’m not really sure. The setting (Skunk Corners) was part of what entered my mind ready-made. The opening lines of the first chapter established the setting, and they have remained essentially unchanged since that memorable night at the library. Once I had Crazy Jake and Wild Harry Colson, the unspecified Wild West setting was inevitable. But you’ll not find Skunk Corners on any map, and attempts to nail it down to a time and place are doomed to disappointment. There are so many little delights and surprises within each story. Were these originally short stories that you strung together? Or did you always want to tell a serialized story? These started life very much as individual short stories. I had written several before I realized I was writing an episodic novel. Because the short-story format works well for kids (and others) who don’t want to commit to too much reading at once, I have stuck with that format in the sequel, Return to Skunk Corners, though I allowed myself more extended plot threads in that one. The self-contained short stories were also easier for me to write while working and raising the kids, because I could let more time go by between chapters without losing the thread of the story. As long as I finished each chapter fairly quickly, the rest could wait. While you have a very strong and unique voice, the structure of your stories has a bit of a Sherlock Holmes feel. What are your influences as a writer? Boy, those are probably too many to name! As a kid I read everything from Tom Sawyer to The Wind in the Willows to Homer Price, and the adventure stories of Robb White and (I’ll confess it) Louis L’Amour. More recent influences are Richard Peck, Gary Paulson, Karen Cushman, and an awful lot of books on the settlement of the West, especially through the eyes of the women and children. My fascination with that period in our history probably influenced the setting quite a bit. And using a first-person narrator for the first time worked wonderfully to help me find my voice–my tendency to dry humor worked better that way! Where did the name of the town come from, Skunk Corners? I’m pretty sure it was just lying around when I started writing. Well, almost. When I wrote the very first story, it was Skunk Springs. When I wrote the second story, it had become Skunk Corners, and it was actually a long time before I realized I’d changed the name. But the skunks were always there. Several times, you mention the pain of hunger that some kids in town suffer. Do you have a personal connection to this problem? It’s certainly a big part of our lives in America. Happily, though we were poor growing up, we gardened, and my parents were creative, so we never went hungry. My Dad did, though, during the Depression, and some of his stories have stuck with me, as have accounts of kids crossing the prairies or settling in less-than-ideal places. I should probably add Laura Ingalls Wilder to the list of influences, and she wrote very feelingly of hunger at times, especially in The Long Winter. If your story got the Disney treatment, what animals would Big Al, Tom, Tommy, Neb Jones and Tess be? I like this twist on the standard “who would play your characters” question (which I can never answer anyway)! I’m pretty sure Al would be a bear. The Librarian is a tough one. He has elements of the big cats, but also of the fox, or even Coyote. On reflection, I think he might be the border collie–a smart dog, but not wild as the others–he’s the strange outsider with a little extra knowledge. Tommy and the other kids I could imagine as a troupe of squirrels (to keep it in the right set of animals) or maybe prairie dogs. Neb Jones is a sheep. Not a mountain sheep. A pretty dumb domestic sheep. And Tess. . . she’s a deer, but a wise one. I understand that you also enjoy backpacking. How are backpacking and writing similar? Well, both are better if once you begin you keep going to the end! And both go more smoothly with some planning, though they can be done by the seat of the pants. For many, backpacking is as solitary as writing, but I travel and hike with my family, so our trips are actually often more social than my life at home. For me, it’s more that backpacking helps refuel my mind and spirit. I get pretty weird if too much times goes by without getting into the wilderness. The next kid’s book isn’t a NInja Librarian story, but a somewhat tongue-in-cheek fantasy called Halitor the Hero. That will be out sometime in 2014. But I’m not abandoning Skunk Corners. At this point, I’m seeing a collection of stories by and about different people around town, not all in Big Al’s voice. I specified “kid’s book” above because my next release will be for the grown-up fans, a humorous cozy mystery (i.e., no blood, gore, bad language or much in the way of violence) called Death By Ice Cream, due out early in 2014. Thanks so much Rebecca. I’m delighted to have found your wonderful work. Thank you! I’m always so happy when people enjoy my work! I have Shirley Link on my Nook, queued up after a couple of library books (always have to read those first, before they expired and leave me mid-page!). Ben, thank you for the nice interview and very nice comments about the book! It was my pleasure, Rebecca. Your book is one of my favorite reads of 2013. Keep on truckin’! That is high praise indeed. I thank you for that! Oh, and I did read and enjoy Shirley Link, and will review sometimes in January. That makes my day! Thank you.